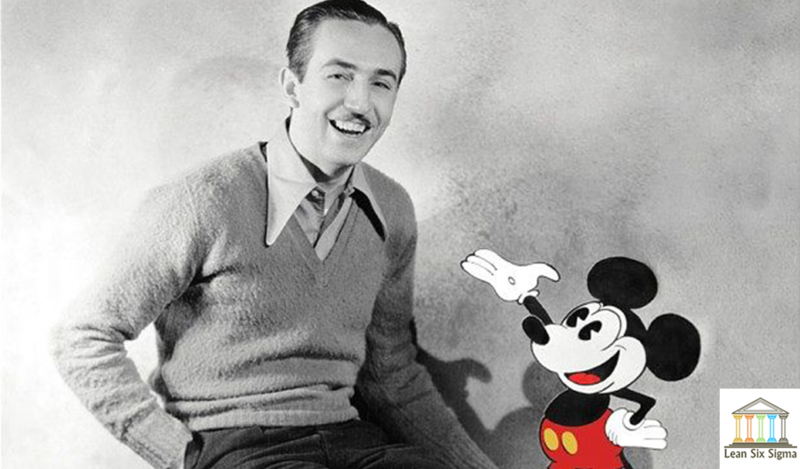 What do Walt Disney and Lean thinking have in common? More than you might think. The father of Mickey, Minnie or Snow White was a consummate Lean Thinker long before the methodology became well know. 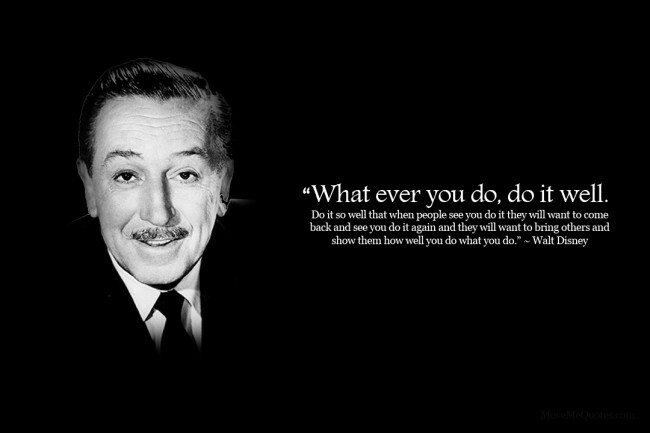 Discover below 5 Lean principles the creator of Disney was following assiduously. Walt Disney’s contributions to Lean visual management are legendary. He invented story boarding, for example, the visual approach to movie-making and the creation of Disneyland in the early 1950s was a brilliant example of Visual Management Deployment. Walt began with a clear and compelling vision which he articulated through images (story-boards). His vision was informed by extensive travel and research into amusement parks around the world. He knew what worked and what didn’t work. 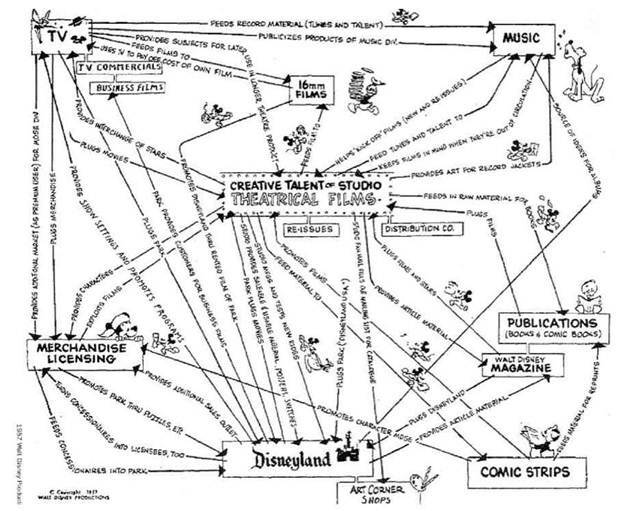 Following the motto “Maps + Cartoons = Better Together”, Walt Disney actively used mind mapping. Below is a map that Walt Disney drew in 1957 to help him think through the complexities of the Disney business empire, complete with cute drawings, of course. The father of Mickey also used Lean visual management techniques to put together an exemplary team, deployed elements of the plan to each team leader and checked progress with visual tools and leader standard work. No doubt his approach to fresh visual thinking and communication served him well! 2) Employees are Active Participants of the Show! Every Disney employee is considered a “cast” member, and this distinction goes beyond semantics. Disney World recognizes that its purpose is to perform a “production” for its guests. Therefore, all employees have a part to play in the production. Human performance is variable in that some people perform better than others but the Disney cast member approach assures that all employees know and behave as if they were on stage. One thing that is universal in life and in business is that if a process is not improving, it is getting worse. Staying the same is not a sustainable, competitive option. Continuous improvement is the key to sustaining success in business and in the ability to continue to satisfy customers. Disney’s continuous improvement process is based on the famous Lean Management method of PDCA or “Plan-Do-Check-Act” cycle of Edwards Deming. This process is applied throughout Disney World and involves all employees. The use of quality improvement projects is crucial to improving manufacturing methods, so that customers continue to be satisfied. Another key element of the Lean thinking is the attention to details and Walt Disney was a fervent advocate of it. Keeping track of details makes the difference between a well-managed project and a project managed by reactionary efforts. Tracking the details, anticipating issues, responding to risk, and keeping watch over a myriad of other seemingly non-connective tasks are what keeps your project moving forward. Always know where your project is today, where it’s going tomorrow and what challenges your team is facing so you can effortlessly communicate these facts to key stakeholders. 5) Committing to the Message is as Important as the Message itself. Following another Lean rule, employees in all the Disney operations are considered cast members, too. They are always reminded that they have an important part to play in satisfying guests. The consistency of this message is a lesson for every industry. Consistency is not only needed in the output process, but in our words and actions as well. This will help employees stay focused on performance and provide the best customer service. Do you wish to bring magic and effectiveness into your business and become a leader as successful and charismatic as Walt Disney was? Follow the 5 lessons the creator of the world’s most famous cartoons was following every day: visual management, respect for people, continuous improvement, attention to details and commitment to your message.